The Detroit Observatory was the first observatory built in the state of Michigan and is the second-oldest building still standing on UM’s campus. 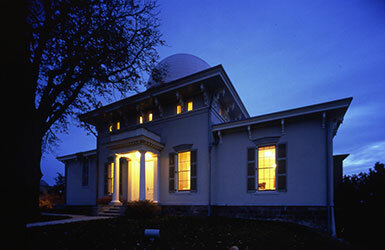 In 2005, the Detroit Observatory became a division of the Bentley Historical Library. The Observatory is currently slated for renovations that will add square footage, as well as on-site improvements including increased accessibility and greater connectivity. No programming — including viewing nights and open houses — is scheduled right now. Stay tuned! Please email Gary Krenz at gdkrenz@umich.edu with questions or for more information.